Do you ever wonder what it’s like to be dead? Where your body goes? What can you see? Feel? Hear? Who can sense you after you’re gone? I think the author of Her Fearful Symmetry must have been pondering these questions long before writing this novel. Audrey Niffenegger tried hard to give her readers a glimpse into the afterlife. I loved the idea, but I didn’t love the book. I wanted to. I really wanted to fall into the characters, get swept away into the charming settings, and be captured by the complexities of the plot. I can’t say it never happened, it just didn’t happen enough to help this book live up to the reputation built after Niffenegger’s first book, The Time Traveler’s Wife. Her Fearful Symmetry begins interestingly enough with a death. Great way to capture attention, but the problem became that I didn’t really care that the character, Elspeth, had died. She didn’t intrigue me, and I couldn’t figure out how her supposedly grieving partner could shift so abruptly upon meeting the twins, Julia and Valentina. Actually, I didn’t fall for those characters too much either. The only one I remotely connected in was Martin, whose OCD behaviors were oddly realistic and charmingly endearing. Setting the story in London should have come with ultimate possibilities to develop a sense of place, but instead the locations simply served as that – flat locations for her characters to move in and out of. 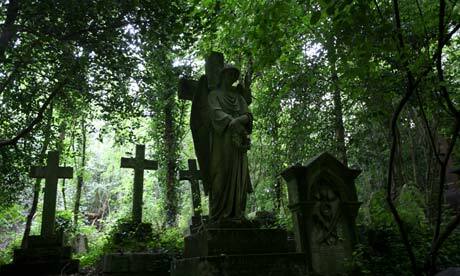 Even the Gothic graveyard and Highgate Cemetery suffered from Niffenegger’s lack of detail, and instead of adding to the tone of the story they were cast aside. It surprised me to learn that she acted as a tour guide there while writing the book. After the initial death, the plot developed slowly. While I will admit the middle of the story had me much more eager to keep reading, it quickly fell into the ‘what are you thinking’ category when dialogue surrounding an important character’s decision abruptly ended with a terrifyingly ignorant and unrealistic decision. And it went downhill from there. I kept reading, but felt like I was riding in a car that the driver kept speeding up and then slamming on the brakes. The ending was a disappointment – not because I need to have everything neat and tidy, but because the ending didn’t make me think. I didn’t even want to figure out the possibilities, I just wanted it to end. Niffenegger’s theme of ‘be careful what you wish for’ makes me wish I had listened to my gut and ended the summer with a more engaging book. Although she is a skilled writer, Her Fearful Symmetry lacked the appeal I was hoping for. when the reader doesn’t give a damn about the characters, you know that book will be a sleeper. That, my dear is a very poor sign! Yes, it’s not a good sign. I really did think I could have liked them…I just didn’t. Too bad, really. Thanks, Kim. Oh dear… yes, I agree, the reader HAS to care about the characters. Thanks for the heads up! You’re welcome, Michael Ann. It was an interesting plot line at first…and then it got kind of absurd. I’ve been curious about this book for ages because it has SUCH a great title, but all the reviews I read say the same thing: it’s disappointing. Thanks for the head’s up! Thanks, Emily. I really did want to like this book…it seemed to have all the ingredients for a great novel, but it just didn’t hang together for me. It’s not horrible, just not as good as I would have liked.